Since arriving in 2005, Mark Levine has regularly traveled around China, delivering lectures at more than 50 universities. He is now a teacher of American culture and public speaking at Minzu University of China in Beijing. 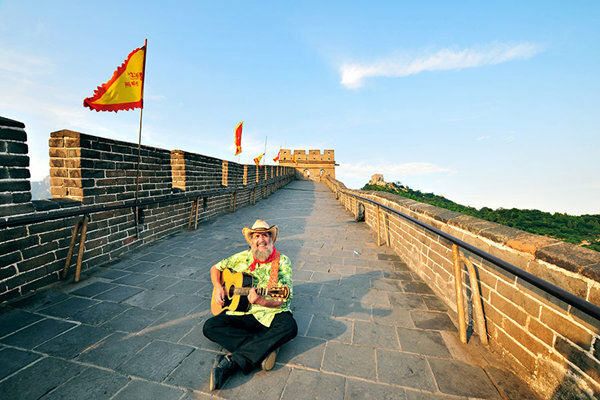 In 2015, the Californian decided that his future lay in China, so to escape the annual round of visa applications he visited the Yonghegong Entry and Exit Office in Beijing to apply for a "green card". The card is a permanent residence permit that gives foreign nationals basically the same legal status as Chinese citizens. Although it is called permanent residence, it only lasts 10 years, and holders must reapply after that time. To aid his application, Levine carried a number of trophies and certificates awarded by the government, including the Friendship Award (the highest honor a foreign national can receive) for his contribution to cultural exchanges, and a copy of his book Stories from My Chinese Journey. To qualify for the card, applicants must meet at least one of a number of requirements, including: to have invested at least $500,000 in a Chinese business for at least three consecutive years prior to application and be able to guarantee a good financial record; to be married to a Chinese citizen; to have made or be making a significant contribution to the country; or to possess skills that are especially needed. "I want to stay in China and continue to teach and contribute. But my work was not considered to be a large contribution," Levine, 67, said. In response, he turned to an official at the State Administration of Foreign Experts Affairs to see if their joint efforts would result in status as a winner of the Friendship Award being added to the list of qualifications, in accordance with a 2014 announcement by Premier Li Keqiang that the government was considering such a move. In April 2016, after an application process that took 10 months and cost 1,500 yuan ($216), Levine became the first foreign national to be issued with a green card via the new category for winners of the Friendship Award. The onetime payment for the card was 300 yuan. The extremely complex application process means that a Chinese green card is regarded as one of the most difficult documents to obtain anywhere in the world. As a result, the Public Security Bureau, which until recently was responsible for administering applications, struggled with lengthy backlogs in the processing of visas, immigration documents and applications for naturalization. The procedure is still a time-consuming endeavor, but since 2016 it has been streamlined and the rules have been relaxed, making it easier for international talent across a wide range of professions to apply. The green card was introduced in 2004. In the decade that followed, just 7,356 people were granted permanent residence－a mere 1.2 percent of the estimated 600,000 expats living in the country during that period－according to the Annual Report on Chinese International Migration published in 2015 by the Center for China and Globalization, a think tank in Beijing. In 2016, the Public Security Bureau granted permanent residence to 1,576 foreign nationals－a rise of 163 percent from the previous year. Last year, the ministry released a new version of the green card containing a machine-readable microchip that can be swiped when the holder buys travel tickets or insurance, uses a bank or books a hotel. "I didn't run into any difficulties when applying. The local government helped me at every possible juncture and checked all of my documents before they were submitted," said Aaron Patterson, co-owner of an English school in Ordos, Inner Mongolia autonomous region in North China. "I received my green card just over a year after applying in April 2017, just as the authorities told me. I'm able to swipe it in most situations where Chinese people would use their identity cards." The 35-year-old Briton arrived in China in 2011 with his wife, an Ordos native, after living and working in Newcastle upon Tyne in Northeast England for nine years. The couple wanted to start their own business, and both agreed that China would be the best place to do it. As their school flourished, the likelihood grew that Patterson would seek permanent residence. Despite being told incorrectly that "you need to be a Nobel Prize laureate or an NBA star" to obtain a Chinese green card, he persevered in his application. "I saw a news item on television that said the country was relaxing the rules and issuing more green cards, so I wanted to give it try," he said. Wang Huiyao, head of the Center for China and Globalization, said the easing of the rules illustrates that China's immigration policy is becoming more open, inclusive and flexible to further deepen reform and opening-up. "In the past three decades, China focused on attracting foreign capital because of two main factors－the huge population and the low level of economic and social development. Now, however, the country has exhausted its demographic advantage, so in the next three decades it should shift the focus to foreign talent," he said. In March, the State Council, China's Cabinet, decided to establish the State Immigration Administration to further improve immigration management and provide better services for foreign nationals. In the two months after it was established, the administration, which is overseen by the Public Security Bureau, approved 1,881 applications, equivalent to the total number of approvals last year. "In the globalized world that people now take for granted, the United States' adoption of restrictive policies on immigration, and Brexit in the United Kingdom, have highlighted the growing unpopularity of globalization as a solution to economic distress," said Frank Pieke, professor of migration policies and development at Leiden University in the Netherlands. By contrast, China's green card policy, coupled with the Belt and Road Initiative, is sending a positive signal to the world that the country welcomes highly skilled expat workers and managers, and is embracing globalization, he added. However, China was a closed, feudal society for thousands of years before finally opening its borders 40 years ago, and the country still has a long task ahead to reform the immigration process and attract more foreign talent. For example, less than 2,000 foreign nationals were given green cards in China last year, while more than 1 million immigrants became permanent residents of the United States, according to statistics from the US Department of Home Security. "As China is now embracing the world in a broader sense, it will be more open to the world than ever before, especially in terms of population flow," said Zeng Shaocong, director of the Center for International Migration and Overseas Chinese Research in Beijing. Expats facilitate the transfer of technology, thus contributing to the flow of hi-tech goods and ideas, along with capital, so the government should give talented foreigners more opportunities to make China their home, provide a more favorable environment and ensure the protection and rights they deserve, Zeng said. However, China is nowhere near the most attractive country for expats, being ranked 41st in an HSBC survey of expats' views of the economic, living and child-raising environments in 46 countries. Despite that low ranking, the situation could improve vastly if China makes a concerted effort to welcome foreign nationals, and the government emphasizes the country's greater accessibility, experts said. "A strong and constant message from the President of China, Xi Jinping, alongside economic and lifestyle incentives for potential talent will have a big impact on mobility flows over time," said William Harvey, professor of talent management and migration at Exeter University in the UK. Back in Beijing, Levine, the teacher at Minzu University, is busy updating his book, and is adding a chapter that will elaborate on the relationship between China and the world. He has no plans to return to the US, and when asked if he will eventually go home, he just smiled and replied, "I am home." ・ To have invested a minimum of $500,000 in a Chinese business in the three years prior to their application. They must guarantee a good financial record. ・ They must hold the post of deputy general manager, deputy director or higher at a business, or hold the post of associate professor or associate research fellow or similar for more than four consecutive years. The accumulated duration of their stay should be no less than three years, and they must have a sound taxation record in China. ・ Applicants should have made an outstanding contribution, or are of special importance, to China. ・ An applicant must have been married to a Chinese citizen for at least five years, or have been married for five years to a foreign national who already holds permanent residence. They must have lived in the country for nine months or longer every year for the preceding five years, and can guarantee a steady income and place of permanent residence. ・ Children age 18 or younger who arrive to live with their parents are eligible to apply. ・ Applicants age 60 or older are allowed to live with blood relatives residing in China. In addition, they must have lived in China for five successive years and the duration of their stay must be no shorter than nine months every year. They must guarantee that they have a steady income. Permanent residence permits for people age 18 or younger are valid for five years. Permits for people older than 18 are valid for 10 years. People who are granted permanent residence must live in China for no less than three months every year. If they cannot meet the requirement, the accumulated duration of their stay should be no less than one year within a five-year period, at the discretion of local public security departments.